Pope Francis celebrates his inaugural Mass with cardinals, inside the Sistine Chapel, at the Vatican. The Vatican lashed out at what it called a "defamatory" and "anti-clerical left-wing" campaign to discredit Pope Francis over his actions during Argentina's 1976-1983 military junta, saying no credible accusation had ever stuck against the new pope. While the former Jorge Mario Bergoglio, like most other Argentines, failed to openly confront the murderous dictatorship, human rights activists differ on how much responsibility he personally deserves. For full world news coverage, visit NBCNews.com. The Vatican spokesman the Rev. Federico Lombardi noted Friday that a Jesuit who was kidnapped during the dictatorship in a case that involved Bergoglio had issued a statement earlier in the day saying the two had reconciled. The new elected Pope Francis held an audience in Rome's St. Peter's Basilica on Friday morning, paying tribute to his predecessor Benedict XVI. 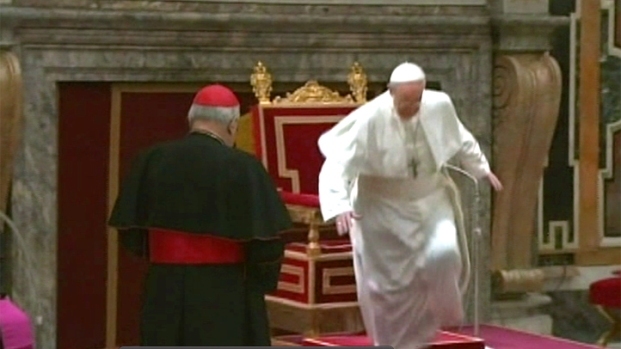 As he stepped off the alter to greet the dean of the College of Cardinals, Cardinal Angelo Sodano, Francis had a slight misstep and stumbled. He immediately recovered. 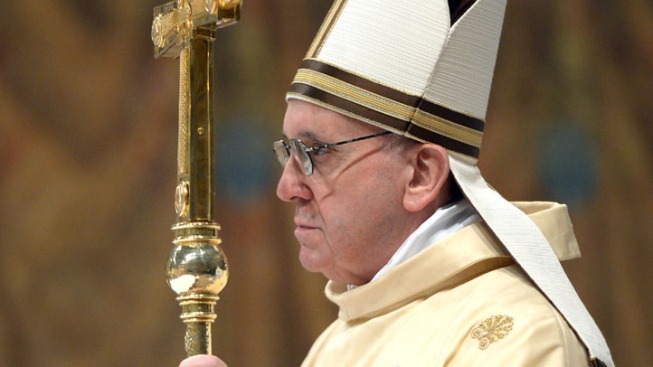 Francis is set to be installed as pope on Tuesday. Lombardi also noted that Argentine courts had never accused Bergoglio of any crime and that on the contrary, there is ample evidence of the role he played protecting people from the military as it kidnapped and killed thousands of people in a "dirty war" to eliminate leftist opponents. He said the accusations were made long ago "by anti-clerical left-wing elements to attack the church and must be decisively rejected." The most damning accusation against Bergoglio is that as the military junta took over in 1976, he withdrew his support for two slum priests whose activist colleagues in the liberation theology movement were disappearing. The priests were then kidnapped and tortured at the Navy Mechanics School, which the junta used as a clandestine prison. Bergoglio said he had told the priests — Orlando Yorio and Francisco Jalics — to give up their slum work for their own safety, and they refused. Yorio later accused Bergoglio of effectively delivering them to the death squads by declining to publicly endorse their work. Yorio is now dead. Jalics, who had maintained silence about the events, on Friday issued a statement saying he had spoken with Bergoglio years later, that the two had celebrated Mass together and hugged "solemnly." "I am reconciled to the events and consider the matter to be closed," he said. Bergoglio in 2010 revealed his side of the story, reluctantly, to his official biographer Sergio Rubin: that he had gone to extraordinary, behind-the-scenes lengths to save the men. The Jesuit leader persuaded the family priest of feared dictator Jorge Videla to call in sick so that he could say Mass instead. Once inside the junta leader's home, Bergoglio privately appealed for mercy, Rubin wrote. Lombardi said the airing of the accusations in recent days in the press following Francis' election was "characterized by a campaign that's often slanderous and defamatory." While harsh, such remarks are not unusual for the Vatican when it feels under attack. Earlier this week, Lombardi issued a similar denunciation of an advocacy group for victims of sexual abuse, accusing it of using the media spotlight on the conclave to try to publicize old accusations against cardinals. The accusations, Lombardi said, are baseless and the cardinals deserve everyone's "esteem." The accusations against Bergoglio started with the priest Yorio and with lay people working inside church offices. Horacio Verbitzky, an advocacy journalist who was a leftist militant at the time and is now closely aligned with the government, has written extensively about the accusations in Argentina's Pagina12 newspaper. Lombardi's statement was delivered after Francis paid a heartfelt tribute to his predecessor Benedict XVI, saying his faith and teaching had "enriched and invigorated" the Catholic Church and would remain its spiritual patrimony forever. Francis offered the respects during an audience with the cardinals who elected him to succeed Benedict, whose resignation set in motion the extraordinary conclave that brought the first prelate from the New World and first Jesuit to the papacy. Francis, 76, tripped and stumbled when he greeted the dean of the College of Cardinals, Cardinal Angelo Sodano, at the start of the audience, but he recovered immediately. 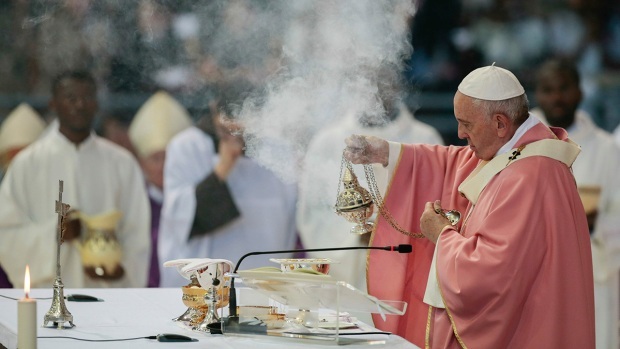 Speaking at times off the cuff, Francis said Benedict had "lit a flame in the depths of our hearts that will continue to burn because it is fueled by his prayers that will support the church on its missionary path." "In these years of his pontificate, he enriched and invigorated the church with his magisterium, his goodness, guide and faith," Francis said. Pausing for effect, he added: "His humility and his gentleness." Francis has said he wants to visit Benedict at the papal residence in Castel Gandolfo where he has been living since Feb. 28, when he became the first pope in 600 years to resign. No date has been set for the visit. Francis is due to be installed as pope on Tuesday. The relationship between the two pontiffs has been the subject of intense speculation given the novelty of soon having a retired and reigning pope living side by side. Some analysts have expressed concern about the influence Benedict and his loyalists might wield over the new pontificate, or worse how certain factions in the church might try to undermine Francis' authority by continuing to use Benedict as their reference point.